Anti-neutrophil cytoplasmic antibody (ANCA)-associated vasculitis (AAV) often causes peripheral nervous system impairments. However, little is known about subclinical involvements of the central nervous system in AAV. We investigated the frequency and progression of cerebral small vessel disease (SVD) in patients with AAV. This single-center, case–control study comprised 56 patients with myeloperoxidase (MPO)-ANCA-positive AAV. Cerebral SVD presenting periventricular and deep white matter hyperintensities was assessed using brain magnetic resonance imaging (MRI). 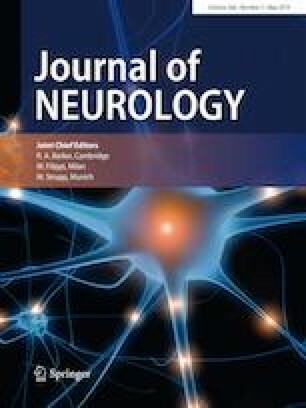 Seventy-five patients with non-stroke-associated neurological diseases were employed as controls. At clinical diagnosis of MPO-ANCA-positive AAV, the frequency of periventricular hyperintensities in the AAV group was significantly higher than that in the control group (P = 0.014). Shinohara and Fazekas grades of periventricular hyperintensities in the AAV group were significantly higher than those in the control group (P = 0.019 and 0.020, respectively). In the AAV group, atherosclerosis-related factors, such as age and hypertension, were not associated with the Shinohara grades of periventricular hyperintensities, whereas serum CRP levels were significantly associated (odds ratio = 6.000, 95% confidence interval 1.648–21.840, P = 0.004). MRI changes were followed in 23 patients with AAV until 2 years after 6 months of diagnosis. Six of these patients worsened the grades of periventricular hyperintensities, while two of 27 in the control group worsened the grades (P = 0.013). Inflammatory events are associated with the occurrence of cerebral SVD before clinical diagnosis of MPO-ANCA-positive AAV. The patients may be continuously exposed to the risk of cerebral SVD after immunosuppressive therapy. This study was conducted in accordance with the Declaration of Helsinki and its amendments. The study protocol was approved by the Ethics Committee of the Medical Faculty, Osaka Medical College (approval no. 2342).